One man lives in a winter paradise. The other lives in a tropical playground. One man is a bundle of energy and emotion at work. The other is soft-spoken and stoic. They took dramatically different roads to get where they are. But when you look at their passions and their impact on people, the similarities are remarkable. Steve and Steve. They’re twin sons of different mothers. 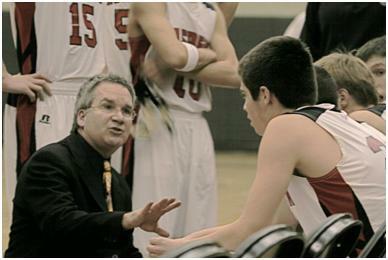 Steve Ketchum just completed his fourteenth season as the head basketball coach at Aspen High School. “Coach K,” as he’s known to his players and the school community, has led his team to ten appearances in the Colorado Championship Sweet 16. Although Coach K didn’t play basketball in high school, he walked on and played one year in college at Southwest Baptist University. 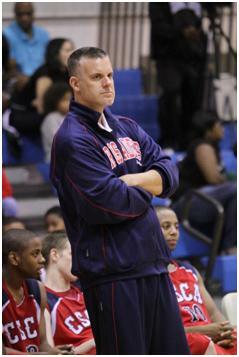 While still in college, he coached middle school, freshman and junior varsity basketball in a local community. He was hooked. Coach K was born when Steve coached at several high schools in Missouri, and was named the statewide coach of the year at age 26. He spent several years coaching in Germany, including coaching the professional team in Karlsruhe… to a championship season. Now Coach K is at Aspen High School, and you can’t help but conclude that this is precisely where God wants him to be. Eighteen-hundred miles away in Coral Springs, Florida, Steve Fitzgerald is the athletic director and head basketball coach at Coral Springs Christian Academy. During this last season, his 19th, he passed 300 career wins. Players, students, and parents all call him “Fitz.” After a stellar high school career in Georgia, Fitz played collegiately at Covenant College. Upon graduation, he decided to join the family business: coaching basketball. His father, Gene, retired after a forty-year career coaching both high school and college. Fitz’s program is a perennial district and regional powerhouse, and this year won the Kreul Classic, beating some of the top schools from around the country. How does little Coral Springs Christian Academy compete with, and beat, these other schools? Good players, consistent execution, and teamwork. Sounds like evidence of great coaching, if you ask me. Coach K and Fitz are gym rats. They love the echo of a leather basketball pounding against a wooden floor. They love the smell and feel of an empty gym. They love the sounds and energy of a home game when the gym is rocking. But the similarities extend beyond basketball… to a spiritual foundation… to an outlook on life… to connecting with people… and walking the walk. Fitz, too, is conscious of the impact he can have on the young men he coaches, and draws inspiration and leadership lessons wherever he can get them. The Bible is a frequent reference and he is known to quiz local business leaders to get their ideas and recommendations. Consequently, his players have been introduced to lessons from such business books as Good to Great and The Five Dysfunctions of a Team. When you speak to former players and their parents about both coaches, you hear about specific conversations that became important channel markers in the lives of these young men. It was rarely the Pat Riley-esque quote, as much as it was the challenging exchange or the encouraging word that was delivered from a basis of love and respect. And it was perfect for the moment. And it is remembered. When separately asked to explain why they’ve been successful as coaches, both men point to the personal connections with their players. Coach K suggests that you need to love your players – and tell them every day – and then expect more from them than they’d ever expect from themselves. Players learn more than basketball and competition. They learn about themselves. They learn how to deal with life. After recording his 300th win, Fitz told the Sun-Sentinel “You never think about the amount of wins you can get… It’s about the relationships you build with players and the good example you can set for them.” In his world, wins are just the by-product of connecting with young men and teaching them to communicate, sacrifice, and believe in themselves. Both men have used basketball as a means to create cultural opportunities for themselves and their players. Coach K runs the Aspen Basketball Academy in the offseason and organizes Travel Adventure trips, including several trips to Europe, and an upcoming trip to Hawaii, to sightsee and play basketball against local competition. Aspen High School has also had foreign exchange students from Europe play on the basketball team (one of whom went on to play for Bobby Knight at Texas Tech). Fitz has likewise organized international trips for his players, including a team trip to Costa Rica to play basketball and participate in missions activities. Coral Springs Christian Academy has had several players from Nigeria, who have become part of the fabric of the school community. Not only do these men pour their hearts and souls into the development of their players, but both are extraordinarily focused on their own children. Look on their Facebook pages. Listen to the first couple sentences of their conversations. They take great pride – and derive great joy – from their roles as fathers. Steve and Mardi Ketchum have seven kids, five of whom have been adopted by the couple. 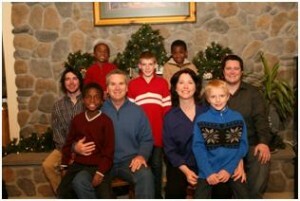 Two of the boys were adopted from Haiti. 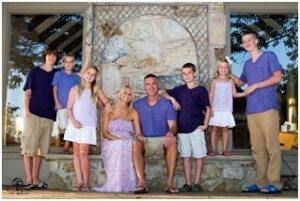 Steve and Teri Fitzgerald have six kids. They attempted to adopt a child from Haiti and were unsuccessful, and are currently working to adopt two boys from Nigeria. Lots of basketball coaches love the game and get tremendous satisfaction from developing kids. But for Coach K and Fitz, it’s not enough to coach a dozen kids every year. They take their roles seriously as husbands and fathers – to thirteen kids between them (with possibly two more). We all hope we have an acceptable answer when someone asks why we do what we do. For these two men, the answer is simple. Coach. Father. Mentor. Different shades of the same role. It’s not just a passion, its God’s calling for their lives. Coach K and Fitz. Two men who’ve never met, living in different climates and arriving at their current jobs by different paths. They love basketball. They love kids. They’re impacting lives in a powerful way – one conversation at a time. Your writing skills are unbelieveable. This article was such a BIG surprise and never expected. All I can say is WOW. I can’t wait to meet Coach Fitz ….. my alter ego. I thank God for all that he has given me and allowed me to do ….. I’m just not done YET. Lot’s of unfinished business and lots of exciting adventures ahead. Also thankful for wonderful people like you Karl. God Bless you and your family and may God continue to bless Coach Fitz and all that he is and stands for. Steve, it is a long time since our days in high school at Lake Braddock. Your story is so inspirational – it simply needed to be told. I love the fact that you’re still trying to get better at what you do every day. I do hope you and Fitz get the chance to meet. Keep up the good work! It was a surprise when I got your phone call and request to use my photo of Coach Steve Fitzgerald. It was my HONOR that you used it to tell your readers about this incredible man. Your article was spot on about what an awesome coach, mentor, friend, father, husband and role model this man is. How I was lucky enough to become the school photographer at his school, only God knows… There I was lucky enough to witness how Fitz treats people everyday. I learn from him and can’t help but have the utmost respect for him and the way he conducts his life and business. Thank you for this great article about my friend. It’s about time the world knows that men like Fitz exist and I venture to say, if there were more men like both these coaches, this world would be a much better place..
Jim, I see you’re a big fan of Fitz’s, too. He has always had great things to say about you and your company. The picture you took of Fitz IS Fitz. You captured him perfectly. Thanks for allowing me to use it. I know the CSCA family appreciates all the work you do and the memories you provide. As I wipe away my tears after reading this article I want to thank you Karl. I also sat here and thought wouln’t it be wonderful if more stories like these could reach the masses. I am proud to say that I know Fitz, you and Jim Donnelly; men of God, character and consistantly doing the right thing. Giving of themselves so that the world will be a better place, sounds cliche but true. Thank you so much for this and thank God for your talent! Gerri, thanks for your kind words, and lumping me in there with some special guys. Coming from you it means a lot. I have been struck by the idea that people like Fitz – and Coach K – we often don’t know their stories, or we don’t take the time to let them know how special we think they are. It’s become a mission of mine to tell those stories. I appreciate meeting these two special men and being reminded that no matter what our role is in life, we should take the time, as these men have, to nurture relationships and make a positive difference by the conversations we have. “Words are the voice of the heart”(author unknown) and can leave lasting impressions that transform lives. Thank you so much for sharing this very inspiring and heartfelt story! Kathy, you could teach a class on making a positive difference with creating relationships and reaching people through conversations – written or verbal. I’m encouraged by examples like Fitz and Coach K, and the impact that they can have on our youth. I love the “words are the voice of the heart” quote, and wished more people realize the impact that those words can have – one person, and one interaction, at a time. I was wondering if I could use one of these pictures for the high school news paper for my basketball article. Thanks a lot.